Dr. Towfighi, considers his patients his friends and enjoys the time he spends with them. He is a very conscientious individual who feels it is important to give the most current level of quality care to all his patients. 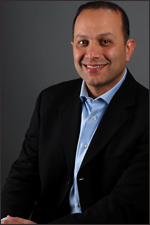 Dr. Towfighi was raised in the Bay Area and completed his undergraduate studies at San Francisco State University. He then acquired his Doctor of Dental Surgery (D.D.S.) at the University of the Pacific School of Dentistry in San Francisco. Following dental school he attended The University of Texas Health Science Center in San Antonio where he received his Certificate in Periodontics, Masters of Science in Periodontics, Certificate in Oral Implantology and Certificate in IV Sedation. Dr. Towfighi is a Diplomate of The American Board of Periodontology (Board Certified), Fellow of the Straumann Institute at the University of Berne in Switzerland and Fellow of International Congress of Oral Implantologists. He is well versed in all aspects of periodontal therapy including cosmetic periodontal plastic surgery, many surgical techniques for treating infectious periodontitis, and full mouth reconstructive dentistry utilizing dental implants. He is an Assistant Clinical Professor, University of California, San Francisco, Department of Periodontology and proud member of many dental society groups including American Academy of Periodontology, The International Congress of Oral Implantologists, American Dental Association, California Dental Association, Sacramento District Dental Society and the California Society of Periodontists. He lectures to local dental groups including the Sacramento City College Hygiene program, and serves on Sacramento District Dental Society committees. He enjoys soccer, graphic design and playing the drums. He is also the proud father of his son Parhom, and loves spending time with his family.